I decided that trying to make diagonal heels was an exercise in futility. There’s probably a reason that many knitters smarter than myself have been knitting heels the way they are usually knit for probably thousands of years. D’ya think? Sometimes goofs end up producing something interesting and usable. Sometimes they don’t. That’s the way the stitch drops. 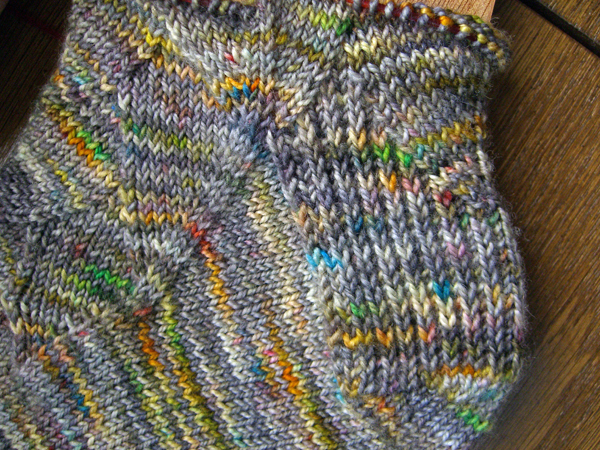 So… I knit the heels again using plain, old heel stitch. I did one modification to fit the pattern: The scale on the back of the heel matches the scale on the front of the leg. I also continued the heel stitch up the leg until the side scale met the back scale. I think an abrupt transition to plain stockinette would have been too jarring. I’m afraid these socks have been posing with pretensions of dragonhood and are fated to be named something rather snake-ish. I’m OK with that. I like snakes. Very interesting and often beautiful critters. I’d also like to clear up something that may have been misunderstood. I receive no monetary compensation from the sale of Cat Bordhi’s new book. I honestly think it’s a gorgeous book or I wouldn’t mention it — my name in it or not. In fact, I receive no compensation from anything on this blog with one exception: If you follow one of the Amazon links, like the one above for George Thorogood, and then actually buy something, I get few pennies. In all of the time I’ve blogged, I’ve managed to amass enough filthy lucre to get two free books. We ain’t gettin’ rich from blogging over here at chez PI. And I’m OK with that, too. That’s not why I’m here.